On September 13, the Lyons community is encouraged to come together in Bohn Park for a 5-year Flood Reflection and Community Picnic. Town officials will give updates on recovery progress, and all are invited to commemorate, and share stories of the 5-year journey. Please save the date and more details will be coming in the next several days. 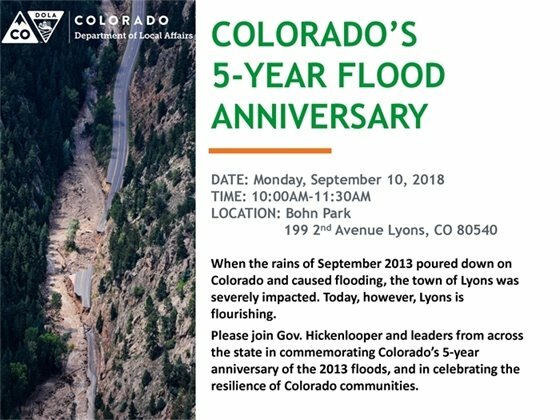 On Monday, September 10, from 10 to 11:30 a.m., Governor Hickenlooper will join state and local officials to commemorate the 5-year anniversary of the 2013 flood event, with a visit to Lyons. All are invited to Bohn Park to reflect on the past five years of recovery, rebuilding and resiliency. Crews have begun concrete work for new sidewalks along 2nd Ave., adjacent to the Bohn Park vehicle entrance. During this phase, the Bohn Park vehicle entrance will be closed through Saturday, Sept. 1 (weather dependent), while paving and curing takes place. Park guests are welcome to park in the wastewater treatment plant parking lot, located on the east side of 2nd Ave., across from Bohn Park and utilize the pedestrian walkways. This project consists of paving a new driveway to the wastewater treatment plant, adding curb, gutter, and sidewalks along 2nd Ave, and paving the road, replacing the gravel section. 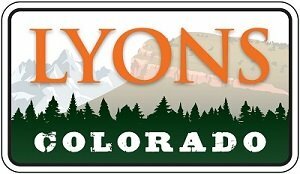 Over the next few days, the Lyons Fire Protection District will be hosting a wilderness Emergency Medical Responder by NOLS class in Lyons. Throughout the week, the class will be in different areas of Town doing medical scenarios. Below is a schedule of when training courses will occur in certain areas. The team will also be in and out of Sandstone park, in between the scheduled site training courses. As the new library approaches construction, the Town and associated partners have prepared the south side of the Wastewater Treatment Plant center (198 2nd Ave.), as the recycling center's new site, as the library will be located at the current RTD lot site. The town, together with Boulder County plans to have the recycling center relocated by Mid- September. The library's construction is anticipated to begin in October. In late September (approximately Sept 21), the RTD lot will permanently close as a parking lot. Please plan accordingly; vehicles parked in the lot after September 21 are subject to towing. Additionally, there is parking along US-36 (eastbound) between Railroad Ave and Park Ave. The Kurt Carlson Skatepark will also be removed around this time, as the building contractors mobilize for library construction. A new skatepark is currently scheduled to be built in Bohn Park, as part of Phase II of the Recovery Project. Friday, August 31 | 5 to 7 p.m.
Kick-off the 2018 Lyons Lions football season with an evening of fun! On Friday, August 31, Lyons football will face Holyoke High School for the season's home opener. Beginning at 5 p.m., a community BBQ will be held at the Lyons Middle/Senior high field, preceding the game's 7 p.m. kick-off. Along with lawn games, burgers, and a DJ, the Boulder County Sheriff's Office and Lyons Fire Protection District will have trucks and equipment, for attendees to view up-close. In addition, the Honor Guard will be revealing the Sheriff's Office new flag for the first time! Cost of admittance into the community BBQ and game: $6 for adults, $4 for seniors and students. Don't miss this fun family event, to celebrate community and support your Lyons Lions! The Lyons Community Foundation (LCF) is pleased to announce our 11th Annual Community Support Granting season. Applications for Community Support Grants are available online now and are due September 10, 2018. These grants are available only once per year and must be applied for at this time. Electronic submissions are required; granting information and applications are available at www.lyonscf.org. The LCF’s Community Support granting program focuses on their mission to improve the quality of life, build a culture of giving, and encourage positive change for the greater Lyons area. Eligible for grants are non-profit organizations in the greater Lyons area who have 501(c)3 status or a sponsoring organization with 501(c)3 status, government agencies, and schools. In 2017, Community Support Grants totaled over $30,000 and were awarded to 14 individual projects. Some of programming that was funded in 2017 included support for LEAF (Lyons Emergency Assistance Fund) and the Lyons food pantry, the Town of Lyons/Parks and Recreation: Sandstone Concert Series and Parade of Lights, Lyons Elementary School, Lyons High School, Lyons Volunteers, and the Lyons Historical Society. None of this work would continue without the dedication, inspiration, hard work, and financial support of Lyons area citizens. LCF is grateful for the abundance of area citizens dedicated to performing inspired work. Are you new to Lyons? Are you looking for opportunities to learn about the community enriching project ideas led by LCF grantees? Are you in search of a small way to give back to the community? If so, we welcome community members to apply to be on the Grants Review Committee. Commitment is two evenings in September. Applications are available at www.lyonscf.org and must be submitted by September 4, 2018.